Between 1986 and 1991 I lived in Pakistan. One of my favorite weekends was to drive up through the foothills of Azad Kashmir, where the evening mountain light was pure and golden, to take photographs and soak up the stunning landscapes. A town I often passed through had a narrow bazaar that had to be approached by driving up a steep incline and navigating a hairpin bend, The bazaar was known as Poonch, and it had a nice little restaurant with purple glass windows and tables that overlooked the river and mustard fields below. There was nothing, I thought, extraordinary about Poonch. 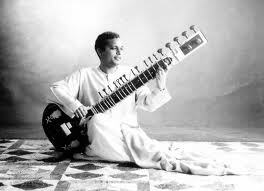 It wasn’t until very many years later that I learned that one of the great maestro’s of the sitar, Ustad Mohammad Sharif Khan, had grown up in the court of the Raja of Poonch where his father was one of the court’s primary musical performers. 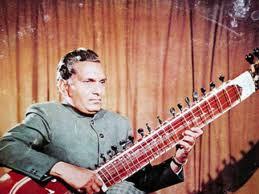 As he grew to fame as a sitarist in the 1940s and 50s, the appellation, Poonchwaley (the one from Poonch) was added to his name. Suddenly, and forever, this minor fiefdom in the mountains of Kashmir was immortalized. In 1991, I left Pakistan and took up a job in the mountains of Kurdistan. I worked in the far eastern part of the region but from time to time travelled around. 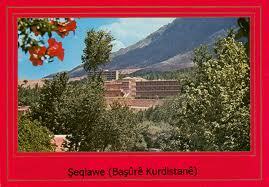 In mid summer I drove westward to a town in the hills called Shaqlawa. This was at the time a sort of political headquarters of one of the main Kurdish parties and we were there for a meeting with a few of the party heavies. The approach to Shaqlawa reminded me of that to Poonch: steep, narrow and windy. In the mountains the air was thinner and clearer just like in Kashmir. Tonight’s selection brings these two towns and the countries and regions in which they are located, together, with beauty and grace. 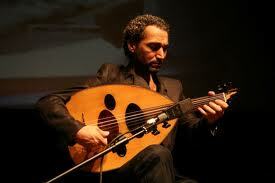 Naseer Shama is an oud player born and raised in Iraq. Half Kurdish, in addition to mastering his instrument he has made it a point of his musical career to speak out against the oppression and subjugation of his people. Resident in Baghdad throughout much of the turmoil of recent years, he championed the cause of children victims of American/European bombing in the early 1990s and has raised money and awareness for the sanctions-crippled health system Iraqis have had live with through most of the 1990s. He has received many international music and humanitarian awards and currently lives and teaches in Cairo. Ashraf Sharif Khan is from Pakistan and is the son of that country’s most revered sitarist, Ustad Mohammad Sharif Khan Poonchwaley. Like his Iraqi counterpart, Ashraf is well regarded as a curious and adventerous musician. 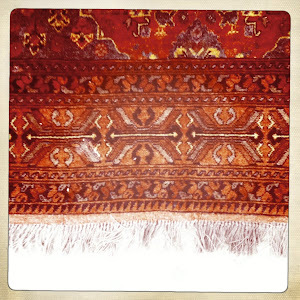 Now resident in Germany, Khan has collaborated with musicians from a number of genres including jazz. This record, Viages de las Almas is an elegant collaboration and fusion of Iraqi, Middle Eastern and South Asian, Pakistani music. The album title means ‘travelling souls’; its co-leaders are a Cairo-resident Iraqi virtuoso of the fretless Arabic lute and a German-resident Pakistani master of the sitar. 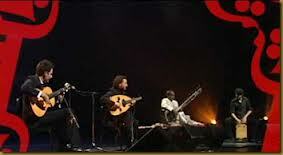 Naseer Shamma provides the composed notes, as well as playing the oud. 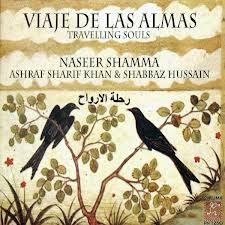 Supported by tabla player Shabbaz Hussain, Naseer Shamma and Ashraf Sharif Khan make beautiful new music. The music, obviously, is what is great about this record. The fusing of Middle Eastern and Hindustani music is seamless and absolutely credible. The playing is of the highest quality and full of soul. With several tracks clocking in over 10 minutes long the musicians appear to have made the choice to let each explore the music at an unhurried pace yet in a clearly reflective way.